Back-Up Story: "History of the Multiverse - Chapter Twelve"
An unnamed voice indicates that there is a computer virus causing a number of catastrophic events across the globe, with the lone exception of the events occurring between Mary Marvel and Zatanna. Mary, ignoring Zatanna, goes out over the water and is attacked by a force with lightning that she drags back to the boat they're on. It's Slig, and apparently his six brothers have been killed by an unknown force. Slig starts turning humans into fish and tries to make an escape. Mary Marvel tries to stop him, so he grabs her chest and burns a hole in the fabric, showing some of her skin. No, seriously. She gets mad, and thereby overdoes her attack on Slig. The Monitors find the source of the computer attacks on New Earth. It's Calculator, engaging in a war with Oracle. Calculator turns off the lights in Gotham in retaliation for Oracle fighting his computer virus. Batwoman and The Question threaten Trickster and Piper, saying they're going to haul them in. Trickster starts to illustrate why he's innocent with puppets, so Batwoman hits him. The Question, however, is fully convinced that they're innocent, and lets them leave. No, seriously. Oracle and Calculator continue to battle, but Oracle handily defeats him, putting the lights back on in Gotham in about five minutes. Mary Marvel starts to attack the creatures that have changes. Zatanna uses her reverse speak to return one human to normal. Slig doesn't flee, he merely stands by, as a being of light emerges from the sea, frying five other figures, then sending out a beam of light that passes through Mary Marvel and kills Slig. Jimmy tries to get Robin, in Titans Tower, to let him into the Teen Titans, and instead makes a fool of himself. Mary Marvel reverts all of the other people with her lightning, leaving them naked. At the Chronal Nexus, the Monitors note that the computer virus has been defeated, and that they can't tell where Ray and his pursuers are. Oracle gloats, and Karate Kid tells her that he's dying. Darkseid gloats over Slig's death, and indicates that he will rule a new multiversal dynasty. The Monitors argue over what to do about the potential collapse of universes through the Source Wall. In the end, only the New Earth Monitor decides to act, leaving the other Monitors behind. Main Story - 1: Still plodding, awful, incoherent, and ridiculous. The writing mistakes are elementary and seen from a mile away, shameful to both the editor, the writers that produced it, and the head writer. I talked to folks at the Wizard World Chicago con. There are people out there who like this series, there really are. Generally speaking, when I ask them why, they don't elucidate too incredibly much. The typical response is that "The ideas are neat, and I want to see where it goes." This is true. The ideas ARE neat. I would like to see where it goes. The problem is, the writing is absolute crap. These concepts are cool. Take a normal gal, Mary Marvel, and give her a corrupting influence, then watch as she figures out who she is. Problem is, this book is just an excuse to show a bad girl hitting things and "accidentally" revealing cleavage while she almost arbitrarily kills, as opposed to the aforementioned. Take Jimmy Olsen, and give him powers, and make him address the consequences of that. Good idea. Except this book is about how funny it is that he has powers, and all the odd scenes it gets him into that are either life or death and treated like corn or superfluous to the extreme. The theme of this series, so far, is "chatting." Many many chats. Very few actualities. "Put your money where your mouth is, punk! You want to accuse this series of bad writing, prove it!" We open with a narrative that has no origination point and is never revealed. Just a "caption" voice telling us in a hacky way about all of the stereotypical emergencies being caused by Calculator's attack. The "shuttle," the "nuclear missile," and the "falling plane." Very original, not archetypical in the slightest as dilemmas. Why not add "falling girl" and "power outage." Oh, wait. Seriously, crack the book and check it out. The "Status Report" comes from nowhere, and yet can somehow determine that Mary Marvel and Zatanna's plight is the only one on the WHOLE of the Earth that doesn't involve this virus. Wow. Amazing. My guess is that it's supposed to be the Monitors, but it's very unclearly done. More on that later as a rationale. "What happened to Black Adam?" "He just... left. So here I am with all this magic and no instruction manual." "I know I came to you for help, Zatanna, but I'm not exactly an amateu-"
"My Deep Six brothers, all dead by his hands!" Note, when you're fleeing from a guy who's the center of the mystery, you never explain who he is to people who could potentially help you, because you're "on camera." But you definitely explain who you are as a character, part of the Deep Six. Sigh. Hey, I have a new idea for a plot from this series. Have one of the characters coincidentally run into a New God just as they're about to bite it. Hasn't happened repetitively four times in fourteen issues or anything. Mary Marvel, a lightning based hero, hit by a lightning wave on the ocean and thrown back? Nuff said. Zatanna says "Everyone move back!" in backwards speak. They are all still in the same place. That's consistency! Slig is a key example of crap here. He appears, lands on the boat, and desires to escape. Being native to waters, his plan of escape is to stay on the boat, where two heroes are attacking him. His brilliant plan? Turn the people on the boat into fish, and use that to cover his escape. Two flaws, chief. One, he stands in the same place and doesn't run (check it out), and two, he sits there monologuing instead of actually doing ANYTHING, saying stuff like: "I can convert the humans and hope they mask my escape!" Great covert plan there, except you SAID IT OUT LOUD to the heroes you're gonna try it on. This writing just REALLY makes me cringe. I'm embarrassed for these guys. The "cleavage" attack burn. Do I even have to go into it? How awfully ridiculous it is? You all know me here, do I cry sexism? If anything, I go to great lengths to say that people generally take stuff out of context and try to find sexism where there isn't. This book has a young girl that's conveniently getting her cleavage ripped open on "accident." If it's not sexist crap, at very least it's exploitive. The Monitors somehow give a crap and monitor closely what's going on with Earth computers? Any rationale as to why? For that matter, WHAT THE HECK DO THE MONITORS EVEN DO? They "protect the balance?" Where did they come from, what do they mean, why will crossovers destroy the balance? Etcetera. The original Monitor, while an odd concept, at least had a defined and cogent purpose. The Anti-Monitor wanted to destroy the universe, and he was going to stop it. Now we have fifty-one guys and gals who just watch stuff, are semi-omniscient, and argue over theoretical destruction to no end. Oh, and Earth computer problems that don't concern them at all. MASTERFUL. Pay attention here, because this one's going to be on the test. In order to characterize Marvel as edgy, they do what they've done about six times already. Hero role model 1 (Riddler, Zatanna, etcetera) stands by while she beats on a bad guy. Mary goes "over the edge" by kicking the crap out of a deserving guy, and either goes too far (killing Clayface) or solves the dilemma. Inconsistently, she's condemned for doing the right thing, or not condemned enough for doing a horrid thing. Here, they went with condemned for doing the right thing, when she blasts Slig for turning people into fish. "You're going too far!" it's intimated, for attacking a guy who's killing people. Uh, okay. An awkward point is made over not calling the JLA because it's "her" problem, but no hay is ever made of it, and heck, why call the JLA for such a small-time threat? Lip service to responsibility and character, I guess. Zatanna, meanwhile, stands and watches all of this doing nothing but talking when it's shown several panels later that she has the ability to turn the people back into humans by talking backwards. Why she doesn't start until later is never resolved. An hey, why would it be? The scene with The Question and Batwoman is the most infuriating single scene I've read in Countdown thusfar. Literally, it made me pause and almost write Paul Dini a letter. I don't tend to write letters to creators. I really don't. I put up these reviews, which people can read or not, as opinion, and that's all it is. Here's the first time in a while I've been compelled to say, "Come ON, buddy." Batwoman and Question had an arc, and a damned good one, in 52, establishing who they are, what they represent, and why they made the choices they made. It was a very good characterization, an intriguing plot, and the arc of their characters were set in motion in such a way that I believe they'd still be around, and still arcing through their character sets, for ten years, if not indefinitely. In other words, I saw staying power and definition. Here, the Batwoman and Question stand by as Trickster and Piper, two murderers, play with puppets. And, as a result of this, seeing them play with puppets, The Question lets them go, sure they could never murder someone. Her rationale, I @$^% you not, through dialogue, is: "Did you forget I was a homicide detective in Gotham's bloodiest department?" Batwoman doesn't stop her. The Question doesn't note her ridiculous logic. What it was was just a cheap excuse for the writers to plug a character in an awful way, undermining their credibility in their own story arc by making them seem incredibly stupid and one-note to anyone who hadn't already been introduced to them. It's played like a joke, and I imagine it was supposed to be a "haw," but it really just takes Question and Batwoman from the realm of serious potential hero into rooftop leaping assuming morons. Jimmy and Robin have a comedic chat. Jimmy finally realizes that his powers only occur when he's threatened, despite it being obvious forever. Not funny, just kind of sad. Not intriguing, just kind of pathetic. And hey, it's not enough to take an adolescent girl and rip her some cleavage, apparently the logic is that when you hit people with lightning magic, they change from fishes to human and lose all their clothes. HAW! Eclipso talking to herself in the ethereal nowhere is in NO WAY a convention that should have died thirty years ago and is hokey enough to even make Captain Kangaroo puke blood. I mean, I love it. Don't you? Let's give an entire page to the fact that the Monitors can't see Ray Palmer or those pursuing him. Why? Just cause! And hey, let's take an emotional beat, like the idea that Karate Kid is dying (for whatever reason), and instead of focusing on THAT, let's look into why Oracle kicks such royal @$$ at hacking, because that hasn't already been established with her character, like, at all, and makes for such novel reading. Bottom line, this series is not an EVENT, it's not even a coherent narrative. It's a struggling ongoing, really, the kind where they try to do something new and crazy every week to keep your attention, when in reality if they just sat down, realized what they had, and wrote a character-based narrative that happens to have a plot, they might have had a masterwork. The lost opportunity kills me, and I'm still nowhere near buying any of the issues of this series. I wouldn't recommend you do, either. Main Art - 3: A good portion of my confusion, or at least my uncertainty that I was correct as to what was happening, came from the art. For instance, though I have neither the time nor the patience to figure it out, I'm not entirely sure if it's the lightning smacking Mary around, or the water. It varied, though. While the Batwoman and Question scene was bland and looked apathetic, there was some real character in the Robin and Jimmy scenes, no matter how contrived the writing. Not bad, but not great, just ordinary. Back-up Story - 3: And even here we have issues. This is the first one of these I didn't enjoy, because it fell into Monitor slapstick and totally lost what the focus of the piece was, the History of the Multiverse. This is the part that's supposed to be cool because it ties into the ongoing Countdown stuff, but given that I could care less for most any of it, it fails. Still, the ramifications and ideas are put semi-decently, and it does round out the story, so I can't complain too much. Back-up Art - 5: Jurgens rocks, what can I say. Every panel I scope, I just say to myself that if I can ever get a chance to work with the guy, I'd literally smack my grandma. It's be like: "Hey, Neal! Have a Werther's Origi-" BAM! Broken hip. 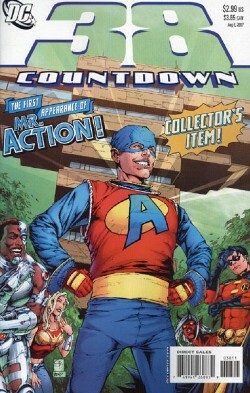 Cover Art - 3: It's interesting, but unfortunately my reaction to the concept is pretty much the same as Cyborg. That's a bad thing. So does it evoke the issue? Yeah. So an extra point for that. But beyond that, it's not the artist's fault that I don't like what's going on, but then again, it doesn't drag me in, either.